Here’s an interview that I’ve never seen before. I discovered it over the weekend while researching the book. It’s from the French TV show, Les Enfants du Rock. The YouTube page says this aired in 1987. I can tell you that it was recorded on June 4, 1986. Bono and the band were in San Francisco on the Amnesty tour and they visited painter Rene Castro that day. Castro took them out for a walk to see one of his murals on Balmy Alley, which is where this was taped. 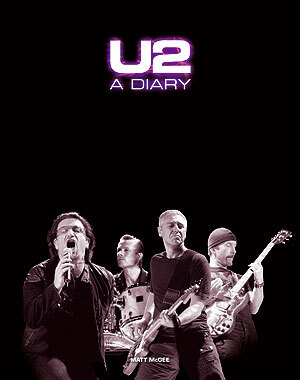 I do have the Castro visit in the first edition of U2-A Diary, but the TV interview is new to me … so that’ll be added to the second edition via the addendum we’re including. Cool. Happy to find this. This recording date of 1986 could not be right as they show the video for With Or Without You, and Bono also says how great it is to hear the song on the radio. (3:50)There also pictures of the Joshua Tree album cover. So this was definitely recorded during 1987. Oh, duh – you’re right. Good catch. Actually, the inclusion of the WOWY video doesn’t mean anything. TV stations do interviews and then edit stuff into them later. Quite possible for this to have to been shot in 1986 and then aired in 1987 with the WOWY video footage added. But if he’s talking about hearing WOWY on the radio, then it must be from when they were in San Francisco in spring 1987. Cool. Thx Donal. It could in theory, be either spring 1987(when they were in the general area) or later that year, when they returned to perform in San Fancisco on November 11th. In the video footage Bono talks about being on the cover of Time Magazine, which didn’t happen until April 27th, on that date however, they were still in the area, performing at Cow Palace on April 25th.